Potty training is always an adventure. Potty training doesn’t begin the month you want your child to use the potty. It’s a developmental learning process that begins around 18 months as your child first begins to notice there’s pee and poop in diapers. It’s true that some children “potty train” in a day or a weekend but only when the child has all the readiness skills and has been exposed to the significant pieces of the potty puzzle. At 18 months, start with a natural immersion in a “positive potty environment”: let your child see others use the potty, talk about pee and poop when changing a diaper, and add a few potty books to your child’s library. Let your child experience the potty routine without any expectations: using toilet paper, sitting on potty seats, flushing noisy toilets, feeling wet, and getting naked without the comfort of cushie, absorbent diaper. Your child will move from the “positive potty environment” to wanting to be a successful potty-goer in his or her own time. Research clearly shows you can’t rush progress. When parents try to over-control the potty process, children often resist and rebel. Children are successful though when adults prepare them for the physical, emotional and cognitive skills needed for pottying. 1. Children must understand the feeling in their body of needing to potty. Parents help their children “read” their bodies to notice the gotta-go signs and the timing of potty stops. 2. Children must be able to communicate the need to potty. Parents often lead this communication in the beginning, modeling the language and the problem solving involved in getting to the potty on time. 3. Children must be able to physically hold their pee or poop long enough to get to the potty. Parents coach their children by reminding them to “hold it” and “quick, run to the bathroom” until using all those new muscles become second nature to children. 4. Children must be interested in making pottying a priority. Potty-going is fun when a child first discovers the potty. Your child has to care to keep the potty routine going. And all children want to grow if they know they’ll be successful. Parents are “potty partners” helping these readiness features come together into a successful potty routine until that wonderful day when your child is taking responsibility over his body and his actions. 1. Start early but with no specific potty expectations until your child shows an interest and ability. 2. Be clear and positive about the goal: one day we say “good bye diapers – hello underwear”! 3. Give playful practice opportunities: when you’re in the bathroom, before bath, especially if you see a dry diaper. Also let your child explore the potty routine in playful ways: sitting on a potty chair with clothes, sitting on doll on the potty, listening for pee and poop sounds, telling silly stories and singing silly potty songs. 4. Evaluate “readiness” after 2 years. Some children have limited success before 2 but most children don’t want permanent responsibility before 2 years old. After 2 years, though, you can start to see which pieces of the developmental puzzle are in place and where you child may need more information or experience. 5. Try naked practice time. Disposable diapers limit children’s understanding of the potty process because they are always dry and comfortable. 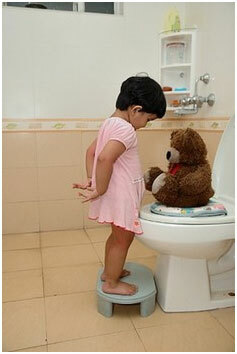 Give your child time to “feel” her body working and experience intermittent potty success. 6. Prepare for accidents and fears. Once your child is in underwear, there are still lots of factors that sabotage potty success: strange toilets, changes in routines, new distractions, an oppositional stage or blips like new siblings or new school. 7. Treat night time potty training separately from daytime. The ability to hold it all night or to wake up and make a bathroom run often takes additional maturity. Be sure to limit liquids two hours before bedtime for success. 1. Don’t let your frustration get in the way. Potty training can get very emotional. Express emotions calmly. 2. Avoid power struggles at all costs. Never let it be “my way” versus “your way”. 3. Don’t change your potty plan in desperation. Stay clear and consistent so your child knows you believe in what you’re teaching and trust that success will come. Most of all, keep your sense of humor. Your child really isn’t wearing diapers to college – promise! For answers to ALL your potty training questions, see The Potty Training Answer Book or email Karen for a customized “potty plan”!